The other day I was in the Dolgellau area with some time to spend on photography during the late afternoon. It was a very showery day and I thought there might be chance of a rainbow or two. There are several easily accessible elevated locations around the Mawddach estuary, and to give my self the best chance of some good images I decided on the New Precipice Walk on the north side of the valley. 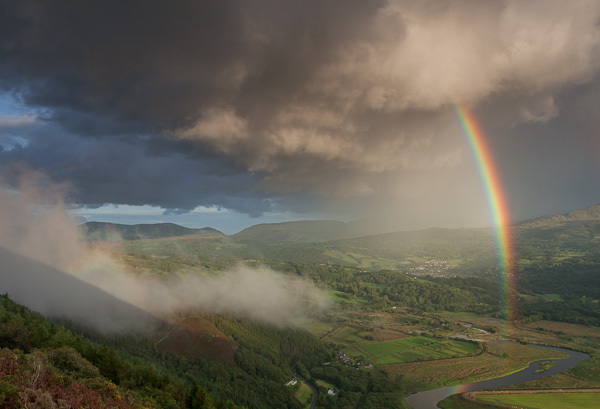 A rainbow would appear roughly opposite the sun, backlit rain showers would be at 180 degrees to this, and a polariser would work at its best at 90 degrees to both, with the bulk of Cadiar Idris in the background. To cap it all, it was a very short walk from the viewpoint to the car park and I could make tea while I waited! The first couple of hours were frustrating. I sheltered in a ruined building while one heavy shower passed over. Later a second big shower moved past to the south and a rainbow began to form. From altitude it was noticeable how much more of the rainbow’s arc was visible than is normally the case. I tried to remain calm, despite the camera beginning to malfunction. It really was touch and go here, but I took a series of images as the shower moved inland. There was a brilliantly clear outer bow as well, with the colour order reversed. Then, out of nowhere, cloud began to form below me in the valley. On it was projected a faint, but definite, Brocken spectre (or glory) , and I managed to photograph it within the rainbow just before the sun disappeared. Has this ever been seen before? Whatever….. it was a scene of primeval magnificence and I just hope I was able to do it justice. See what you think!